Need more information about booking Home 8355544 ? Welcome to our holiday Beach house, available for you to book holiday escapes all year round. The property is a large, 4 bedroom, fully self contained Beach house, the location is an elevated position and the wrap around decking & high raked ceilings catch the soothing ocean breezes. Come & enjoy the quiet location & features including a wrap around deck, rear deck area with BBQ overlooking the saltwater in-ground pool, it is a perfect home to relax in your surrounds & enjoy your next Beach holiday escape with family, friends or just as a couple - and your pets are welcome. 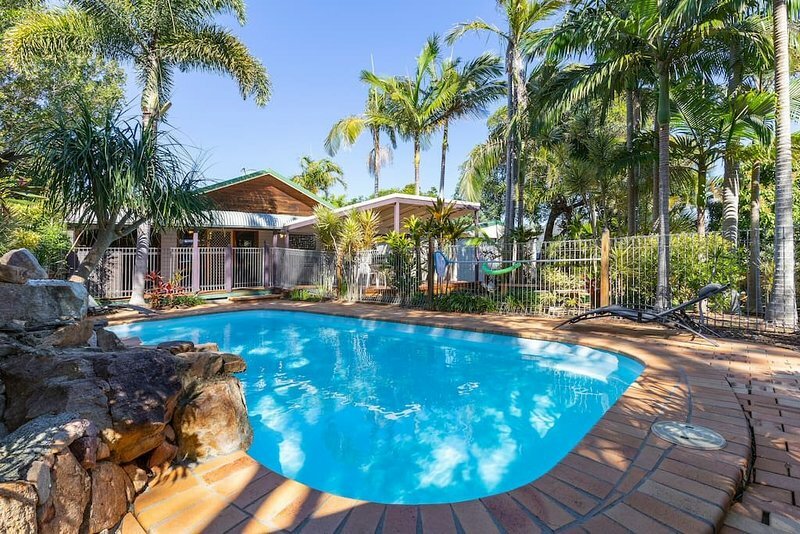 The location of the property is just a few minutes drive to local beaches, shops, Mt Coolum National Park & more you will enjoy the ambiance of the home, the quiet location and relax in your surrounds. FREE unlimited Wi-Fi incl. The bedding configuration is 2 x Queen beds & 2 x Single beds. All linen is provided. The master bedroom provides an ensuite with shower & toilet & the second bathroom provides a shower over a bath. There is also a second toilet in the property. The laundry includes a washing machine & dryer. There is ample driveway parking. You will enjoy the quiet location & ambiance of the property & relax on the large rear deck area with BBQ overlooking the in-ground, salt water swimming pool. Our Beach House is perfect for couples & the whole family including your furry friends (pets). All linen is provided & FREE unlimited Wi-Fi is included. You are just a few minutes drive to the local shops, Coolum & Marcoola Beaches, Mt Coolum National Park, Golf courses & there is plenty explore & enjoy in this beautiful region of the Sunshine Coast. The beautiful Yaroomba Beach is a wide expanse and providing kilometres of gorgeous sandy beach stretching from the rocky headland of Point Artkwright to Marcoola & Mudjimba beaches. It is well known for its surfing, fishing, or for your morning & afternoon walks or run. This stretch of beach provides patrolled areas during Spring and Summer months and dogs on leash are allowed on the beach. Other beaches such as Coolum & Marcoola Beaches are just a few minutes drive. Enjoy a walk up Mount Coolum to experience its breathtaking views, play a round of golf at one of the local courses including Palmer Golf Course, Mount Coolum Golf Course & Twin Waters Golf Course & of course there are many cafes & restaurants also to enjoy in the region. You have use of the entire house, note that the shed is locked up. There is ample driveway parking for you. Note this property has a strict NO PARTY policy. NO large gatherings, parties or functions are allowed at this property. If you don't have a car there is ample public transport available approximately 500 metres from the property. There are also Taxis & Uber rides available. If you are flying in to Brisbane airport or Sunshine Coast airport we can assist with airport transfer arrangements. You have use of the entire Beach house property to yourselves. We are always available to assist you during your stay and can be contacted either by mobile or email. We will provide these details to you prior to your arrival. - Pets are welcome however we appreciate you cleaning up after them - Thank You. You can get in touch with John and Sharon (the owner) through the contact form on this page. Send John and Sharon (the owner) an email through the contact form on this page. Alternatively, if there’s a phone number on this page, you can call them. How do I contact John and Sharon (the owner)? If you’ve already booked, go to Manage your holiday booking to view John and Sharon the owner's contact details or send them a message. Or send John and Sharon (the owner) an enquiry through the Contact the owner/manager form if you’d like a quote or more info first. When you pay online through the Book your stay form, a booking request is sent to John and Sharon (the owner). You’ll find out within 24 hours whether they’ve accepted - no money will leave your account before then. You can also request a quote from John and Sharon (the owner) through the contact form. The owner will email you the total cost for your dates and a link to book and pay online. Use the Book your stay form to pay provisionally online. You can pay by credit/debit card or PayPal. John and Sharon (the owner) will have 24 hours to accept the booking and no money will leave your account before then. Why can't I call John and Sharon (the owner) before booking? You’ll need to contact John and Sharon (the owner) to do this. Send them a message in Manage your holiday booking or through the contact form on this page. You can request to change the dates or number of people on your booking via the Manage your holiday booking page. To change your holiday dates use the Edit booking button. If you need to change the number of guests staying then send John and Sharon (the owner) a message. If John and Sharon (the owner) agrees, they’ll send you a revised quote outlining the changes. You can review and accept/decline this from the Manage your holiday booking page. You’ll have 48 hours to take action before the revised quote expires.